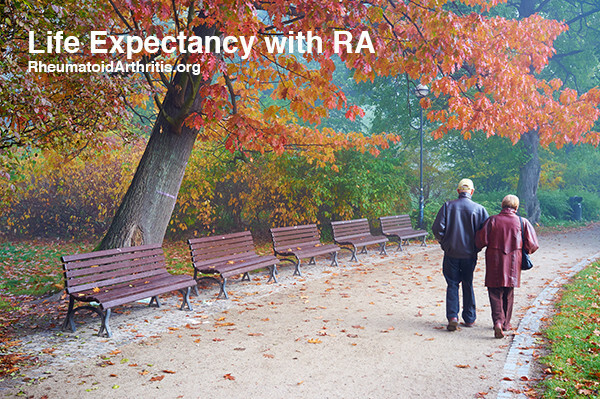 RA Life Expectancy: Does Rheumatoid Arthritis Affect Life Span? The predicted life expectancy of a patient diagnosed with rheumatoid arthritis (RA) is problematic to accurately calculate due to the vast amount of unpredictable variables involved. As a chronic disease, RA tends to be progressive. In other words, it is a long-term disease in which symptoms tend to accumulate over time. This accumulation results in an overall worsening of the patient’s symptoms. Presently, doctors do not know what causes nor triggers the disease. That being said, they suspect it is likely initiated by a combination of factors including genetics and environmental influences. Because there isn’t one specific cause of the disease, there is also no known cure for RA. Today’s medical technology and research, however, provide a variety of treatment options, which can prolong the lives of patients, slow the progression of disease, and provide some symptom relief. These are just some of the factors which make it difficult to predict an exact life expectancy for RA patients. What research has found is that it isn’t the disease itself which reduces the life expectancy of patients. It’s the varying complications that develop as a result of the disease which cause life expectancy to shorten. For example, RA can cause respiratory and cardiovascular conditions which can compound over time and lead to a shortened lifespan and possibly eventual fatality. What is the Outlook for Patients Living with RA? RA research has come a long way over the past several decades. Historically, little was known about RA and the wide-ranging symptoms and complications which resulted from the disease’s inflammatory processes. Today, doctors understand that there are several conditions that may present themselves in RA patients. Patients who work closely with their rheumatologist can have these potential complications addressed early on, and pursue appropriate treatments to prevent symptoms from advancing. Despite working proactively with medical specialists, there are cases where patients suffer from severe symptoms which do not respond to current treatments. Unfortunately these cases can lead to a shortened life expectancy. What is the Average RA Life Expectancy? Studies have found an association between RA and a shortened lifespan. This is different than saying that RA itself causes a premature death. The complications that develop (hardened or blocked heart arteries, lung scarring, blood cancers, etc.) as a result of an aggressive RA disease course are what put patients at a greater risk for a lower life expectancy. Do not lose hope! Despite these study results, it’s also important to note that many RA patients live well into their 80s and 90s which is an average expected lifespan. Women are almost three times more likely to develop RA as men are. Symptoms seen in women are also typically more severe. To add insult to injury, the disease course for women can also be more progressive and can potentially involve more systemic complications. Predicting a life expectancy for male patients with RA is difficult. While men typically don’t experience the same severity of symptoms as women do, men already have a baseline higher risk of cardiovascular disease than women. When you add the diagnosis of RA, their risk for developing cardiovascular disease and diabetes increases even more than for women (with or without RA). RA is an autoimmune disease that makes patients more susceptible to developing other conditions. This can compromise the health of patients long-term. That being said, there are factors that can improve a patient’s life expectancy through mitigating the complications experienced during the disease course. Patients who are diagnosed with RA at a young age generally experience more severe symptoms. This is thought to be in part because the duration of the disease is longer. As a result, this longer disease duration could potentially lead to a shortened life expectancy for some patients. Patients with RA are at greater risk of developing more severe health complications due to a weakened immune system and chronic symptoms. Some cancer rates are higher in RA patients, specifically lymphoma. Breathing problems also tend to present themselves in RA patients. This is due to the ongoing inflammation in the lungs with leads to respiratory issues and lung scarring. RA patients are at a much greater risk of developing heart disease than the general population. It is estimated that as many as half of the deaths in RA were caused by heart disease. The exact link between rheumatoid arthritis and heart disease is unknown. However, it is suspected the increased inflammation leads to earlier and faster development of hardened heart blood vessels. Quitting smoking is highly advised for all RA patients. Research has shown a strong link between patients who smoke and the increased severity of RA symptoms. Smoking causes lung inflammation, which can possibly activate the RA antibodies to further aggravate and escalate the disease course. With an already weakened immune system, RA patients should also avoid smoking because on its own it leads to chronic respiratory disorders. When compounded with the diagnosis of RA, especially in seropositive RA patients, these disorders are more likely to develop more quickly than in non-RA smokers. One study showed that seropositive patients were three times more likely to die from respiratory complications than seronegative patients were. There is a proposed link between seropositive patients and more aggressive symptoms of lung nodules and lung scarring. Off course, these are conditions that everyone should be concerned about. Keeping your body healthy through diet, exercise, and positive habits will go a long way to reducing the risk of fatality from any of these conditions. How Does Treatment Improve Life Expectancy? Early treatment greatly improves the prognosis of RA patients. If treatment begins before symptoms cause too much damage, patients can generally go on to live a better (maybe even almost normal) quality of life. Ongoing treatment and monitoring can help rheumatologists provide the most appropriate and personalized care for their patients. Each patient will experience a different set of symptoms over their lifetime. Doctors look for warning signs of other complications associated with RA and work to either prevent them or treat them as they develop. The main goal of treatment is to reduce pain and improve quality of life. Many patients experience very effective treatment plans and continue to live their lives making appropriate lifestyle adjustments along the way.